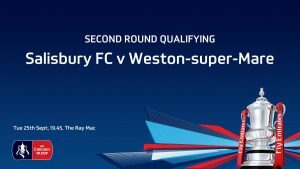 On Saturday 22nd September many of the Salisbury FC Supporters traveled to the Woodspring Stadium for a 2nd Round Qualifying FA Cup match against a fit Weston-super-Mare team. After being a disappointing 2 nil down at half time, Salisbury FC came back strongly and it ended with a 2 – 2 draw giving us a home replay at the Ray Mac on Tuesday 25th September at 7.45pm. Let’s all turn out in force for this game and help our team to victory and another round in the exciting FA Cup.